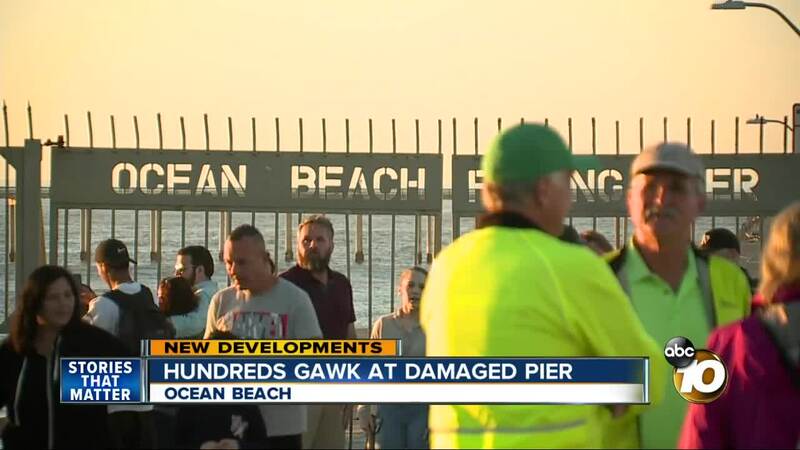 SAN DIEGO (KGTV) - Hundreds lined the sidewalk in Ocean Beach, gawking at the closed pier, damaged by the high surf Friday morning. Danger still lingering, lifeguards called two boogie boarders in after they were swept closer to the pier. Up above, visitors came in waves to the closed gates, coming to understand they won't get to step foot beyond the chains and lock. Tourist Kate Kelly traveled with two friends from Connecticut celebrating their 65th birthday and were disappointed to find the pier shut down, "We find this news out," she said bringing her hand up to cover her mouth, "it's broken, it's the surf, it's sad." The railing splintered under the force of the waves, knocked askew like toothpicks. "It's crazy what mother nature can do you know? Destroy a lot of stuff," San Diegan Jorge Verdugo said. Local Pamela Dragon has lived in Ocean Beach for four years. She said since the high surf, it's been a constant stream of people gawking. "It's entertaining," she commented. The beach, cleared of debris Saturday, Dragon said was partially due to residents, "people were taking souvenirs from the pier and people were saying they were going to build shelves and do different things with it." She hopes the pier will revive and reopen, "It made me kind of sad, I hope the community can come together and you know rebuild it." According to the City of San Diego's Facebook Page, there is no timeline on when the pier will reopen.